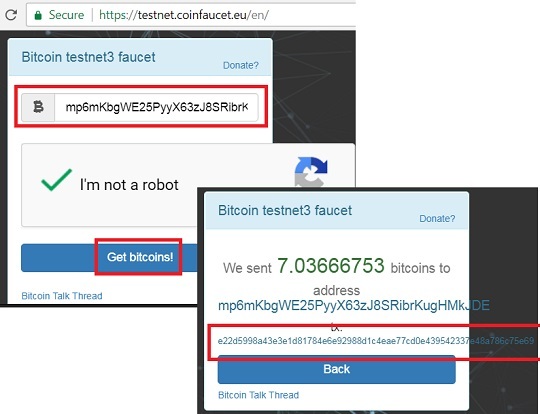 This section describes how to receive test Bitcoin from testnet.coinfaucet.eu. If you want to play sending and receiving Bitcoin on the Test Network, you need get some Bitcoin funds from somewhere first. The first place you can try is https://testnet.coinfaucet.eu/en/. Enter an address generated from your test wallet: "mp6mKbgWE25PyyX63zJ8SRibrKugHMkJDE". Confirm that "I'm not a robot" and click "Get bitcoins!". You should a few bitcoins sent to your address. Copy the transaction ID, e22d5998a43e3e1d81784e6e92988d1c4eae77cd0e439542337e48a786c75e69, as a reference.